Buy buttons… we all know they are alive in well through advertising and other social media platforms. Everywhere we turn “Buy Now” or “Buy This Today” is popping up all around advertisers marketing campaigns. These features allow consumers to interact more directly with the brands including opt-in options and the most popular buy this now option. Whether it is on Facebook, Pinterest or the most recent adapter of Instagram. buy buttons are becoming a hot commodity on the social media frontier and they are in full force. Buyable Pins. Just a few measly years ago, we didn’t even know what this so-called Pinterest sensation was. Just another app someone thought may work out… well guess what, it did and now it is hotter than ever. Pinterest has incorporated a feature now that when visiting the pins you are interested in, you can click and it will take you directly to the page to be able to buy the product. The convenience of being able to stay in the app and make a purchase increases the user-friendly idea of the app and keeps users happy. 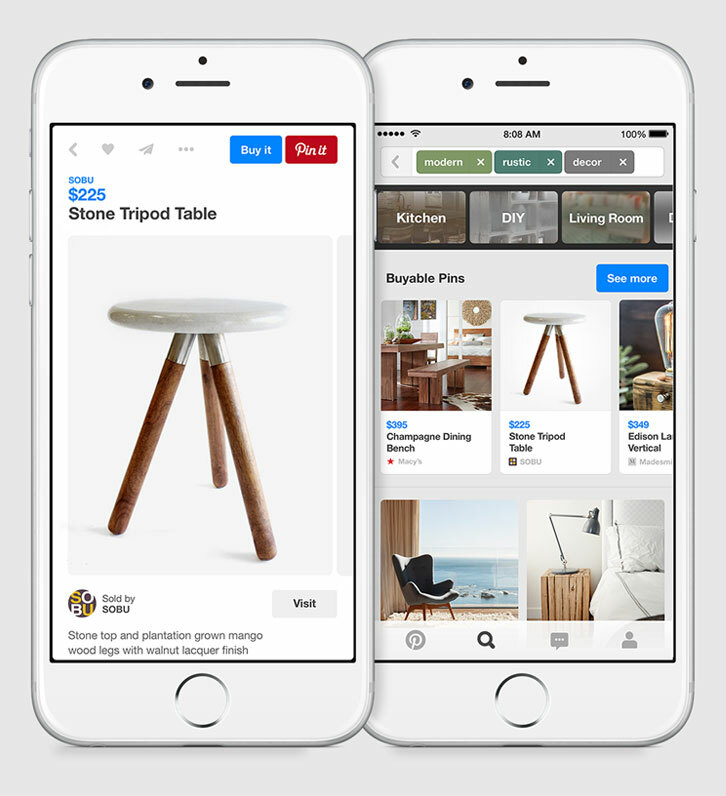 The fact that Pinterest is positioning themselves as an e-commerce platform is a big move for them and is working. If that isn’t smart direct consumer marketing, I am not sure what is? Then you have Facebook and Instagram who have also adopted this genius sensation. 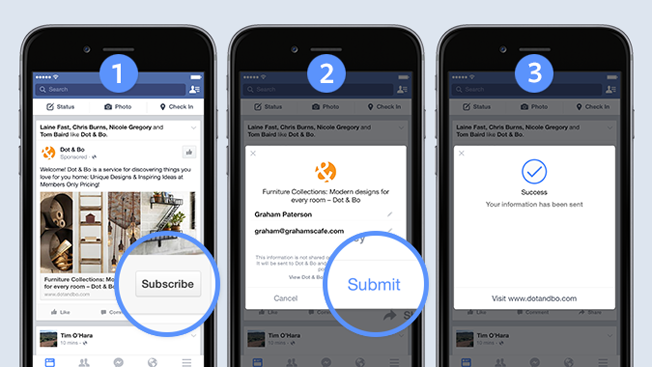 Facebook has also added options such as opt-in features and subscriptions and they are going head to head with Pinterest to give them some first line competition. Because of Facebook’s huge following, this is working and working well. When it comes to retail, everyone is really on Facebook (give or take of course). So when it comes to getting users buying and involved, their new options of buy buttons and opt-in’s are working and hitting home with sales for retailers. Then you have Instagram who is adding “Shop Now”, “Sign Up” and “Install Now” buttons to help increase their user-friendly platform. This will essentially provide their advertisers with easier audience targeting and controlled advertising in general. Not only are the apps gaining more engagement and better feedback from their consumers, but the retailers are winning as it is becoming a one-stop shop experience. This could be a huge sensation for small businesses as they can now purchase advertising and target consumers to their site with also the option to opt-in and purchase through their sites. Think of the potential here. It could literally change someone’s business completely! So next time you hop onto Facebook, Instagram or Pinterest look for this feature and see if you are a victim to their social targeting. I know I am… But I also am a sucker and have used it to purchase or sign up for something. So is it shame on me or touche for the apps? I think it could be a bit of both. Social Media = 1 and Kelsey = 0. You win. Great topic Kelsey. I’ve seen the rise in the “Buy Now” CTA buttons on my Facebook page and was intrigued how retailers are now able to incorporate their e-commerce efforts with their social media. If marketers couldn’t measure their social media ROI before, they definitely can now. Hi Kelsey. Thank you for sharing this. Buy buttons are important and adding them in social networks is big news. Great post. I have noticed this new phenomena and cannot decide if I am a fan of it or not. It seems as everywhere we go…in the digital world of course, we are bombarded with offers to buy products and services. I will never forget the first time I heard someone say “I bought it on Facebook!” It was an adorable dress, but I still was taken back and was surprised that people actually click on the offers. Thanks for sharing your post. It is interesting to know that it is not only Facebook that is adopting the “buy now” button. Amazon understands e-commerce and the ever-changing rules of engagement probably better than anyone. Did you know approximately 30% of every e-commerce dollar in the U.S. is spent on Amazon (CentreCom News 2015)? That’s crazy. And now, Amazon offers customers the opportunity to make a purchase without having to leave their Twitter feed. Simply use the hashtag #Amazon Cart. Button or no button — where there’s a will to purchase, there’s a way. Thanks for your insightful comments! I think you all bring up valid points of discussion. I like where it was pointed out marketers can definitely better measure their ROI through the use of 1-click purchases on mobile platforms. This is a great tool that I didn’t even think about at the time but that could gain a lot of traction and become useful in so many ways to each brand and their business. Mobile is the next big thing and it is here definitely as we all saw through Black Friday and Cyber Monday this year with a significantly less amount of shoppers in store and way more online. When regarding my feelings toward it, I haven’t quite decided either. I liked going onto Pinterest without being solicited but at the same time, I like that I can click and check out the pricing, sizing and all product specs for something that catches my attention. I guess you could say I am walking both sides of the bridge with it. One thing I have noticed on my Facebook is that I am getting targeted with ads and buy now options for products I am not really interested in. To me, it is just annoying. Yet on Pinterest and Instagram I find them to be useful tools as they seem to be less soliciting and more of just an added feature to make my in-app usability more convenient. So props to you and Facebook… shame on you! I love these statistics on Amazon. The first company that comes to mind when thinking of e-commerce is indeed them. They make the buying process so simple and convenient both through their app and mobile website it is hard not to purchase. I think the hashtag feature is genius. Similar to Dominos and their pizza emoji! I still get confused over that though.. how do they know what pizza you want! Haha just all random side note. Anyway great food for thought from everyone and it definitely sparked my thinking… maybe it sparked yours too?